In my teens, I loved his playing on the track "Theme from MASH," from Ahmad Jamal's album "Jamalca," not yet reissued on CD. RIP. Renowned bassist and educator JAMIL NASSER died Saturday afternoon, February 13, 2010, at Englewood Hospital, after suffering a stroke and massive cardiac arrest. He leaves behind his beloved wife of 30 years, Barbara (Baano) Nasser, their son Najee, and sons Umar, Muneer and Zaid, and daughter Aliyah, from his first marriage, to Karimah. Janaza services were held on Monday, February 15, at the Dar-ul Islah Mosque in Teaneck, New Jersey, followed by burial at the Islamic Cemetery at the New Jersey State Memorial Park. All of Jamil's and Baano's closest relatives attended both services, including his son Umar, who flew in from Saudia Ariabia where he lives and works. His mother, Mrs Claudie Joyner, who is 102, was not able to attend. However, Jamil and Baano spent some time during the summer visiting her. PLEASE HOLD THIS DATE: The Committee for Jamil’s “Celebration of His Life and Gifts” is looking at Sunday, March 21, 7:30 p.m., at Saint Peter’s Church, 610 Lexington Ave, NYC 10022. If the Committee obtains that date, more information will be sent. Or we will be looking for another date. Jamil Nasser (George Joyner) was born in Memphis, Tennessee, where he began his musical career in 1948 as a tuba player in the Booker T Washington High School Band. Shortly thereafter, he was encouraged by his boyhood friend and neighbor, the musical genius Phineas Newborn Jr., to play the bass violin. He began playing the bass in 1949, and was selected to play bass with the school dance band after an impromptu audition. The Director was Phineas Newborn Jr. Jamil and Phineas recorded in Memphis in 1953 for Peacock Records. After high school, with three all-expense musical scholarships to choose from, he chose Arkansas A.M. & N. College in Pine Bluff, Arkansas, where he organized and led the college band, the State Collegians. They went on to win the Pittsburgh Courier Poll for the "Best College Dance Band of 1950-1951." After college, Jamil was drafted into the Army and was bassist and arranger for the 3rd Army Special Service Package Shows. Other members included Wynton Kelly, Duke Pearson and Leonard Nimoy (Mr. Spock from Star Trek). During that time, he was commissioned by General Bolling (Commander-In-Chief of the 3rd Army) to orchestrate the overture for the 3rd Army extravaganza, "Southland Panorama," using the 100-man concert orchestra plus the 19-piece dance band. Upon being released in 1955, Jamil joined BB King’s band as bassist and arranger, and played the Electric Bass (a newly created instrument at that time). Phineas asked Jamil to join him in New York for his debut at the Basin Street East in 1956. They were well received by the musicians and the Jazz fans in New York. The trio was invited on the Birdland tour in 1957. Jamil was featured with the Phineas Newborn Jr. Quartet until 1958. Thereafter, he was featured bassist with all-star jazz groups in both recording and personal appearances with such notables as Lou Donaldson, Donald Byrd, John Coltrane, Randy Weston, Red Garland, Gene Ammons, Herbie Mann, Al Haig, Lionel Hampton, Anita O’Day, Chuck Wayne and "Philly" Joe Jones, to name a few. Forming a quartet in 1958 with the late legendary Oscar Dennard (pianist), Idrees Sulieman (trumpet) and Buster Smith (drums), they performed throughout Western and Eastern Europe, North Africa, and the Middle East for three years. After returning to America in 1962, Jamil was musical director and leader of the trio at Chuck's Composite, an East Side night club that was the phenomenon of the early sixties. Jamil joined the Ahmad Jamal Trio in 1964, along with Frank Gant on drums, an association that lasted for eleven years. During this same period Jamil was vice president of Ahmad Jamal Productions Corporation, Hema Music Incorporated, and Jamal Publishing Corporation. He was President of The King Series, an organization that specialized in special artistic packaging of all-star groups assembled with emphasis on musical compatibillity and historical importance, such as the importent packaging of the quartet which featured Red Garland, Lou Donaldson, Jimmy Cobb and Jamil, which toured Japan to sold-out houses in each city. As producer of the jazz portion of the first "Memphis In May Festival" in 1977, Jamil assembled expatriate Memphis jazz artists and performed with them to more than 13,000 people on the famous Beale Street. Artists included were Phineas Newborn Jr., George Coleman, Hank Crawford, the late Sonny Criss, Frank Strozier, Harold Mabern and Marvin Stamm, to name but a few. He served as musical director and bassist for actress/jazz singer Cybill Shepherd's east coast engagements. Jamil produced and directed the first enormously successful 3-day Westchester Jazz Festival for the Presbyterian Jazz Society in Mount Vernon, N.Y. He was a Vice Presdent of the Jazz Foundation of American 1990-1995. He was the CEO and founder of Global International Art, Inc.. (GIA), which had a board consisting of artists and business people whose primary interest was to preserve the classical Jazz Art that is based on the total Black experience of swing-soul and beauty. As an educator, he was director of jazz workshops at State University of New York st Stony Brook. For many years, he was music director of the Universal Jazz Coalition, Inc./ Jazz Center of New York. producing special concerts and different workshops for instrumentalists and vocalists. Jamil and his trio, Harold Maben on piano and Frank Gant on drums, conducted well-attended weekly free jam sessions, which were important due to the construcitve critiques offered by the trio. Among his most notable concerts were the intensely beautiful presentation of his Bassoon Choir, the fulfillment of a long-time dream, under a grant from the National Endowment for the Arts; his concert honoring one of his best friends, Major Holley, titled Bass Ball, his tribute concert for Red Garland was one of the most musically-satisfying concerts of the year; and he, along with Max Roach and Cobi Narita, spearheaded the fundraising concert for his best friend and mentor, Papa Jo Jones, at the Village Gate, raising $15,000 in cash which he presented to Papa Jo. Jamil’s other mentor and great friend was Lester Young; Jamil used to say that Papa Jo and Prez had their own special language. They watched over Jamil and taught him “the tricks of the trade”. Jamil made the arranements to get Prez out of France and back to the U.S., during his final illness. 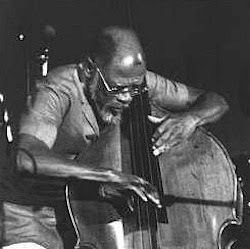 For more than a decade, he was George Coleman’s “bassist of choice”, performing in hundreds of supremely successful concerts, where his steady, strong, yet sensitive, lyrical bass lifted the group to new heights with each performance. One of the finest tenors of our time, George never sounded better nor appeared to enjoy the music more than when he played with Jamil. He was also bassist of choice with Randy Weston for many years; his first performance with Randy (as George Joyner; he legally became Jamil Nasser later in the same year) was at the 1958 Newport Jazz Festival. One of the highlights of his working with Randy was performing with the Boston Pops Orchestra. With Randy, he recorded three albums in Paris over one weekend: Tribute to Duke Ellington, Tribute to Thelonious Monk and Music of Randy Weston. The Preacher's Wife Featuring Whitney Houston, Denzel Washington, Lionel Richie.